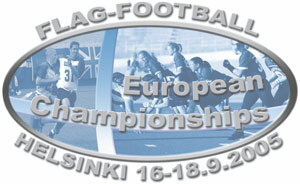 Te European Championships Flagfootball Seniors has started. In Helsiniki, Finland 5 Women and 8 Man Teams are fighting for European Championship. At first day the finnish Woman are still unbeated and play the final against France at sunday. At men Group A France win the group unbeaten. Group B was a heavy fight. In the end three teams has 4-2 points. Now Great Britain as Number 2 will play the semifinal against France while Austria will met Italy in the second semifinal.